Billy Reid launched his first collection in Spring 1998, and The Council of Fashion Designers of America named him, then William Reid, "Best New Menswear Designer" in 2001. Unfortunately the economic environment post 9/11 led him to cease operations after his Spring 2002 line. Re-focused, re-imagined, and with the simpler name, Billy Reid, he returned to designing in 2004, and GQ named him "Best New Menswear Designer in America in 2010." Currently Billy Reid has six locations: Florence, Alabama; Nashville, Tennessee; Charleston, South Carolina; Dallas and Houston, Texas and New York, New York. Reid once had a location in Charlotte's South Park Mall but it closed in early 2010. Reid also has a line of footwear co-branded with K-Swiss that is available at his boutiques and in select other retailers. The Lenox Square Bloomingdale's has featured Billy Reid's line for a number of seasons and even has a "shop in shop" in the mens store. No two Billy Reid stores are alike, and each has a character all its own. The stores incorporate cool design elements and use antiques and other odds and ends to make each store feel like it belongs in the city in which it's located. Clothing-wise, expect classic styles in high quality fabrics, "low-fi Southern-bred luxury," according to the Billy Reid website. 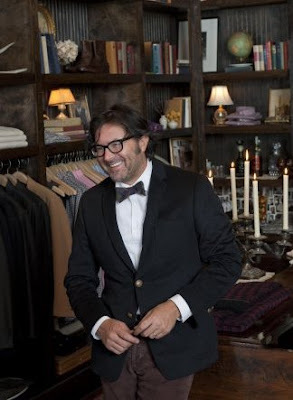 Some might call nearby Sid Mashburn in Westside Urban Market competition for Billy Reid, but I think having them both in the area will be a plus. Stores like Sid and female-oriented Ann Mashburn, along with Anthropologie and G.Gilbert, are creating a fashion destination for fashionistas near and far. I'm told Reid has wanted a store in Atlanta for years, and feels the Westside is the perfect fit and that he got a "good vibe" on a recent visit. Are you familiar with Billy Reid and are excited to see him open a boutique? Have you never heard of Billy Reid are at least curious? Do you think the westside will soon be not only known for great food but also great shopping? Awesome news. Love the Dallas store. Welcome to Atlanta! Florence, Alabama?? What a random place for a high-end store. Westside is gaining steam. Wouldn't be surprised to see an expansion there soon...and an Apple store. any knowledge on where in the development the store will be?? Cant wait!! Hell Anon Re : location. Yes, as I say in the post, Billy Reid will be on the plaza level in a 2,500 s/f space just below Abattoir. I would say I'd be interested, but as a big, fat guy, the only thing I could find in any designer store in my size may be socks. And even if there is a token "2xl" floating about, it is cut to the size of a regular man's "L". Well maybe you and half of the state of Georgia should lose some weight and then you buy yourself some nice clothes? Florence, Alabama because that's where he lives... His line is also carried at Neiman Marcus in Lenox Square. I'd never heard of him until a few weeks ago when It's a Brad, Brad World went down to Florence to see his flagship store. Every fashionista from NYC was there.